Always work 2’ x 2’ section at a time. 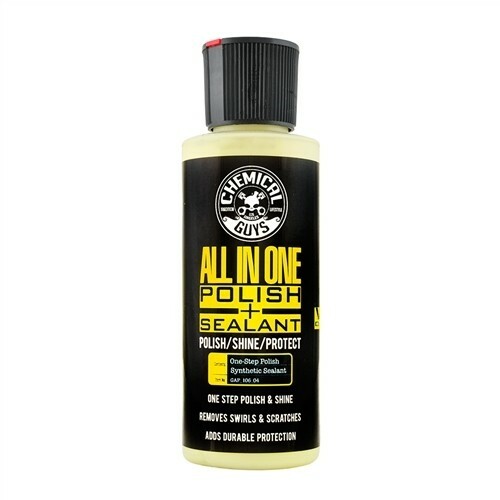 Using a polishing pad, work the V4 All-In-One Polish into the paintwork to remove swirls, scratches, and oxidation. Remove exccess residue using a premium microfiber towel to achieve a brilliant shine. Follow by applying a coat of your favorite Chemical Guys wax or sealant. For even more durable and long term protection, follow by applying a coat of your favorite Chemical Guys wax or sealant. Apply 4-5 drops to desired pad. Prime pad with Chemical Guys Pad Conditioner. Set machine 1000-1500 RPMs to spread product. Work until optical clarity has been achieved.